7 October 1962 Rolled-out for engine runs and system tests to commence. 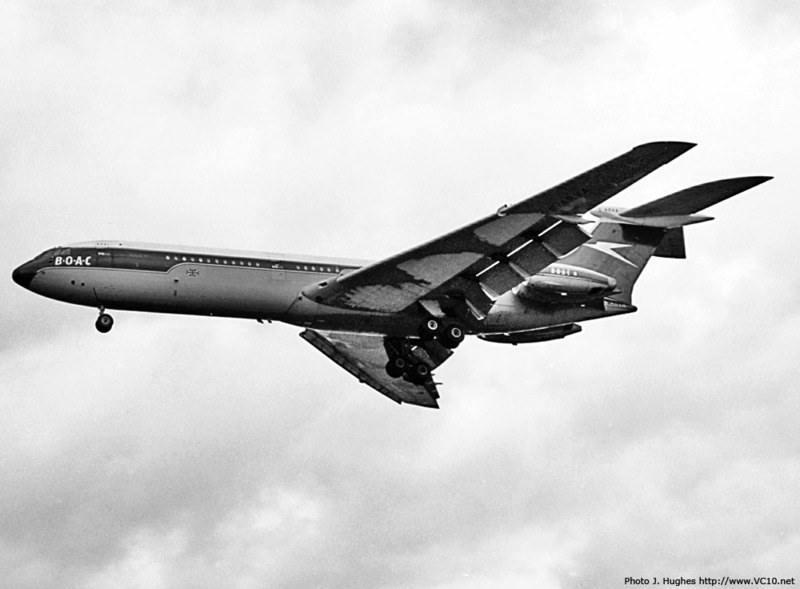 8 November 1962 First flight. 16 January 1963 Registered as G-ARVA to BOAC. 7 June 1963 Flew back to Brooklands for drag reducing modifications to slats and engine nacelles. 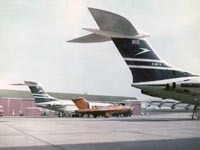 July 1963 Rejoined other VC10s at Wisley. 9 August 1963 Certificate of Airworthiness issued. 12-19? 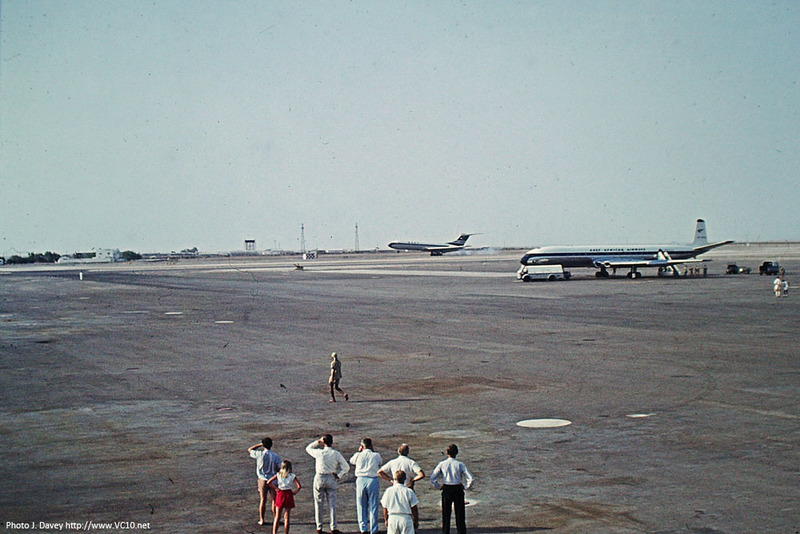 August 1963 Spent one week at Aden for hot weather engine ground running trials. 5 May 1964 Ferried to Brooklands by John Cochrane and Eric Bucklow for removal of test equipment and refurbishment to production standard. 'VA was the only airframe from the testing fleet to be refurbished at the factory, the others went to Marshall for this. 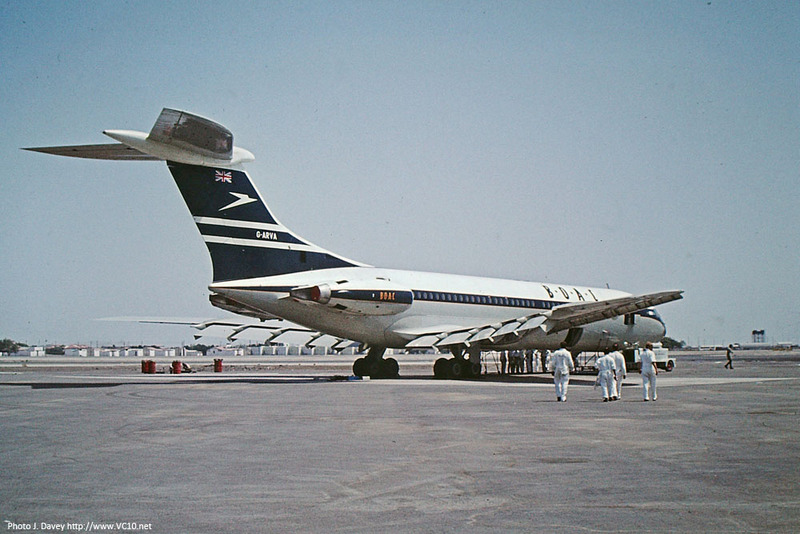 1964 Wet-leased to Nigeria Airways in BOAC colours with Nigeria Airways stickers. 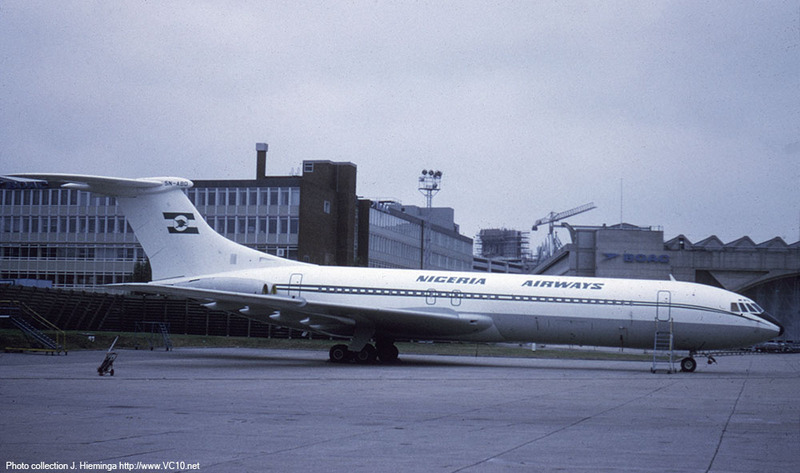 September 1969 Sold to Nigeria Airways. 29 September 1969 Re-registered as 5N-ABD. 20 November 1969 Lost in accident at Lagos, Nigeria. 1. 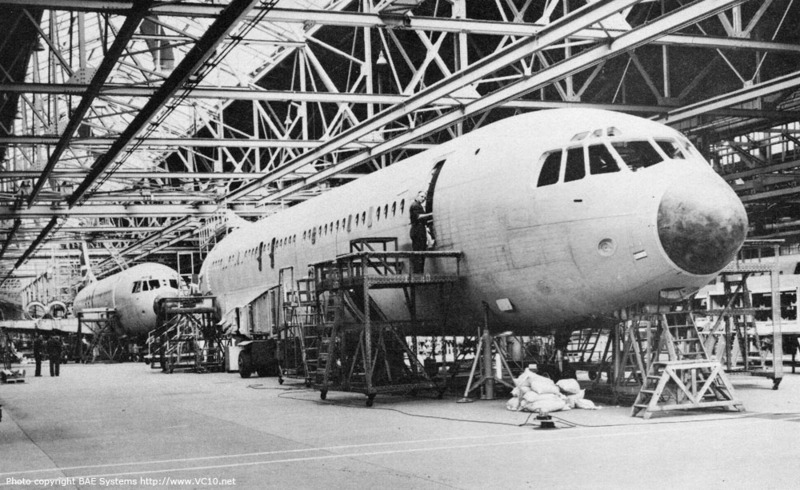 The first production VC10, G-ARVA, is seen here behind the fuselage of G-ARVB on the assembly line at the Weybridge factory. 3. G-ARVA parked at Wisley with ground supplies of air and electricity connected, this may have been a promotional photo for the company that supplied the GPU. 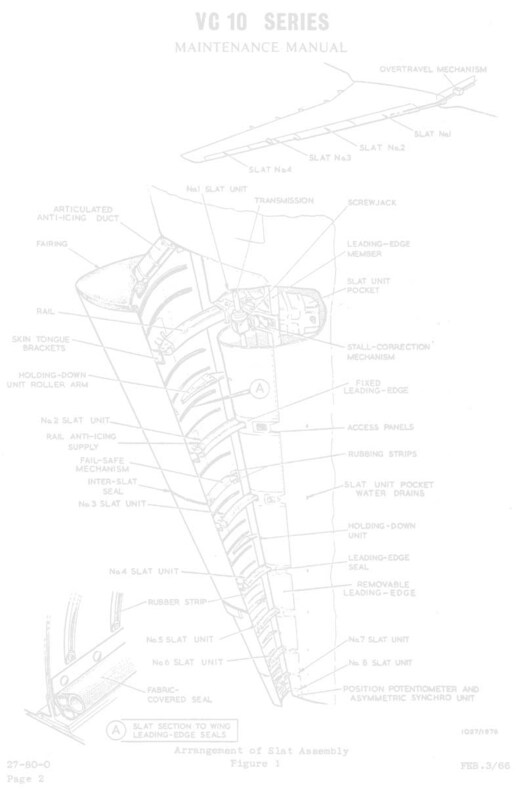 'VA was allocated to system testing in the flight test programme. 4. 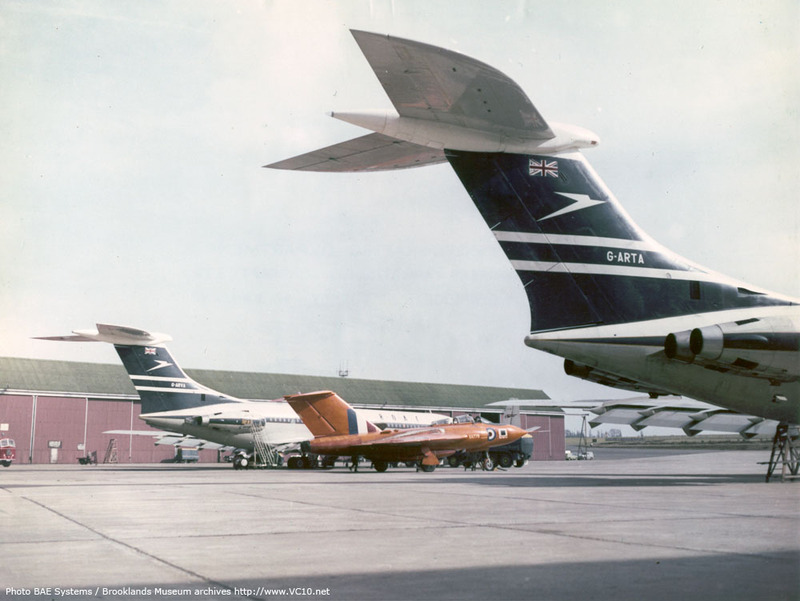 On this photo G-ARVA is parked at Wisley behind Gloster Javelin XA778, the tail of prototype G-ARTA is in the foreground. The Javelin was normally based at Boscombe Down but this aircraft was fitted with sensitive calibrated instruments and was used to fly with (most likely) G-ARTA to verify the readings of its pitot-static system. 1. On 12th August 1963 G-ARVA flew to Aden for hot weather engine tests. 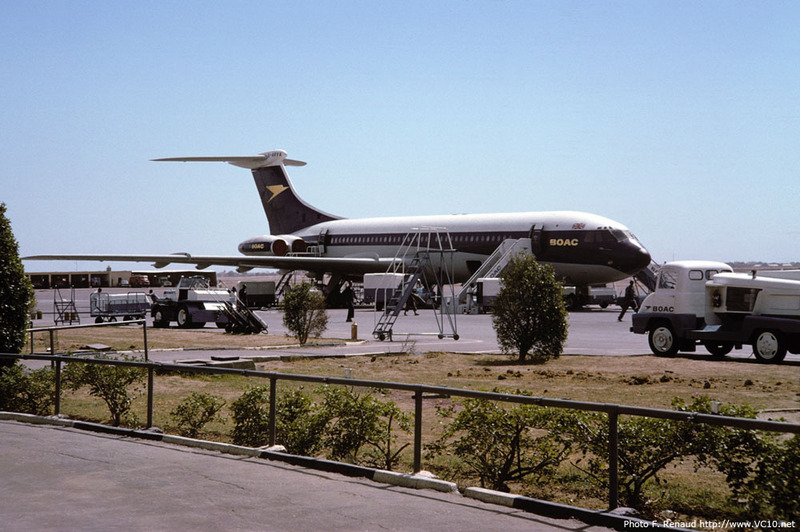 An East African Airways Comet 4 can be seen on the apron. 2. John Davey took these photos of the landing, taxi in and the aircraft parked on the apron. 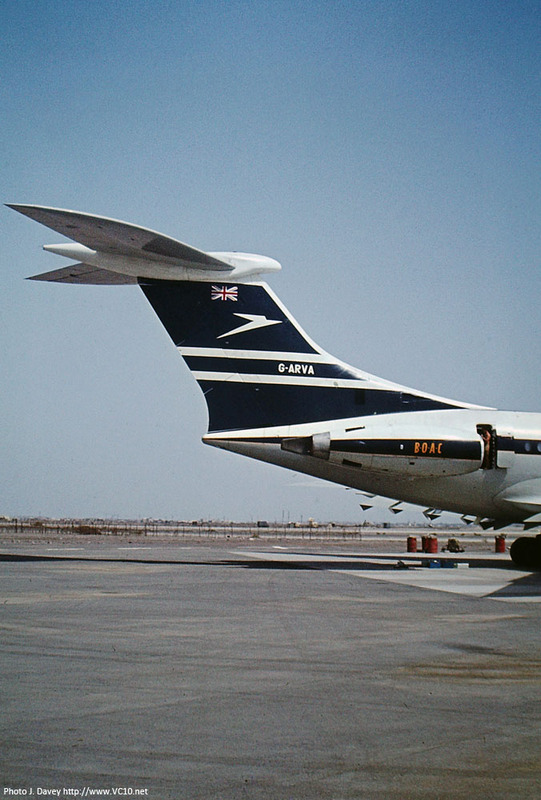 The Aden Airways Argonaut is an ex-BOAC aircraft, the livery is the same one as applied on G-ARVA but with different titles. 3. Parked on the apron with a welcoming comittee around the aircraft. 4. A few days later, on August 14th, John was allowed on to the apron to take more photos of G-ARVA. He, along with his friend, was also invited on board for a look around. 1. 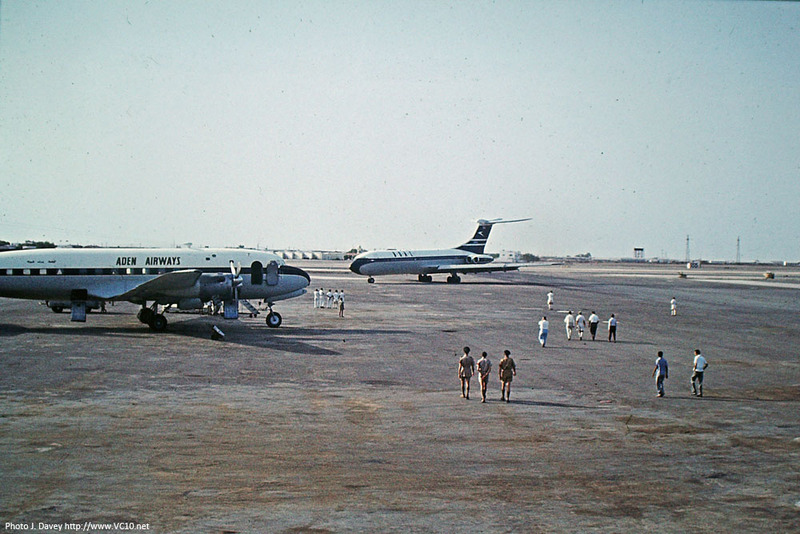 G-ARVA at Aden with white-suited engineers looking after her. 2. G-ARVA's tail as seen at Aden. 3. 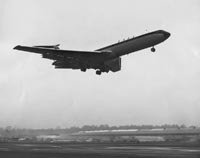 G-ARVA coming in to land at Heathrow in 1965 with frost under the wings from the cold soaked fuel. At this point it carries the first 'Golden Speedbird' livery with the stepped cheatline. 4. 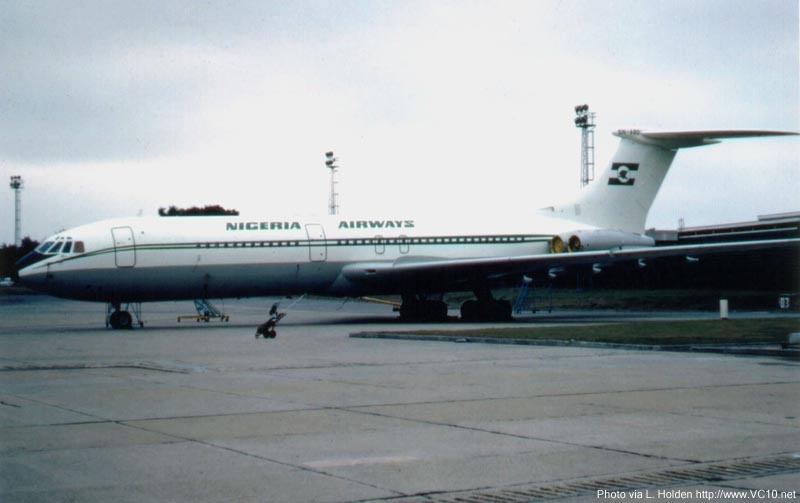 In 1964 G-ARVA was wet-leased to Nigeria Airways. 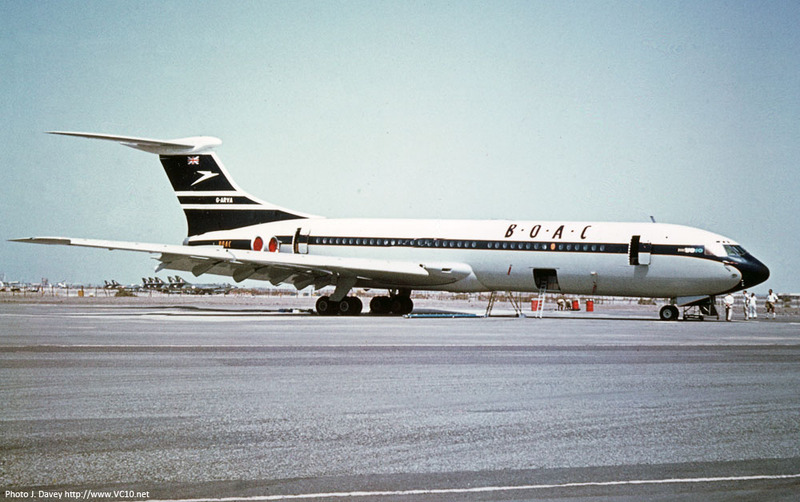 Stickers were used to modify the BOAC scheme. 1. G-ARVA at Manchester, still in the first 'Golden Speedbird' scheme. 2. 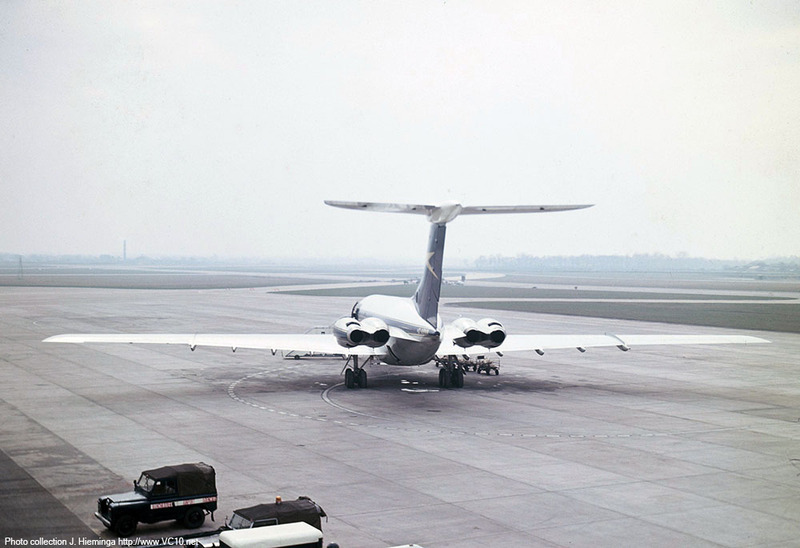 Keith Till spotted G-ARVA at Heathrow in July 1966. 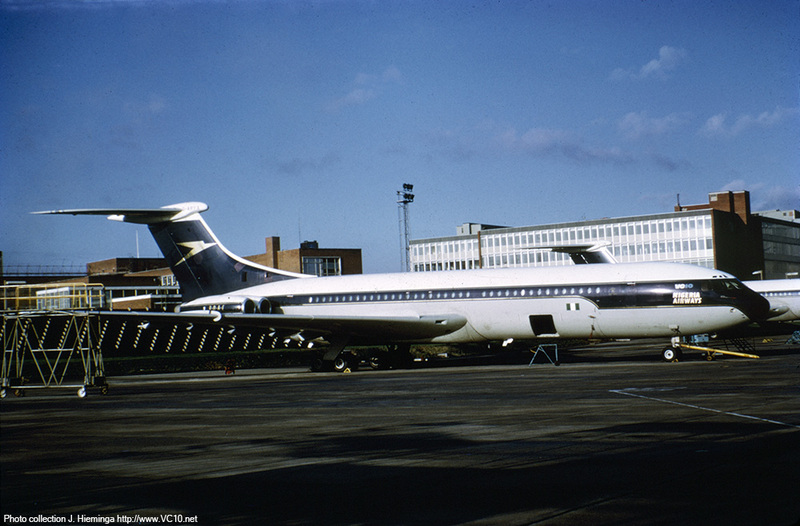 It has been repainted in the second variant of the Golden Speedbird livery which was introduced on the Super VC10. 3. 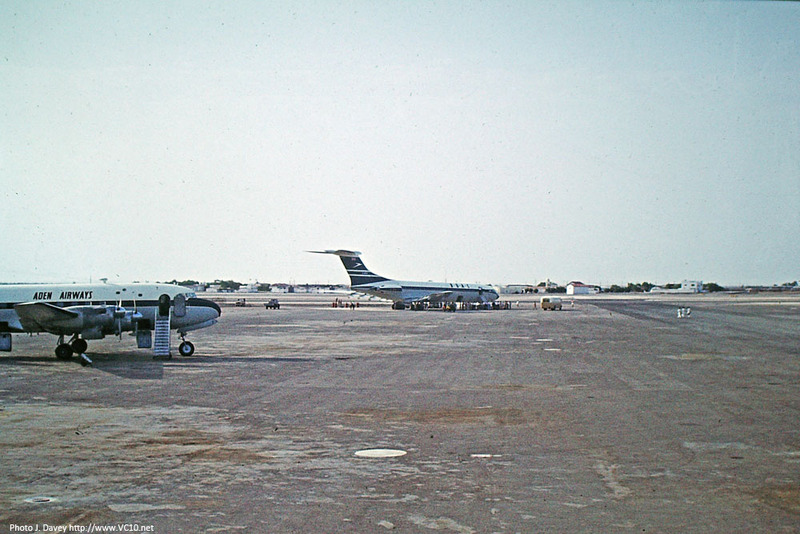 G-ARVA is seen here in Khartoum, Sudan in August 1966. 4. 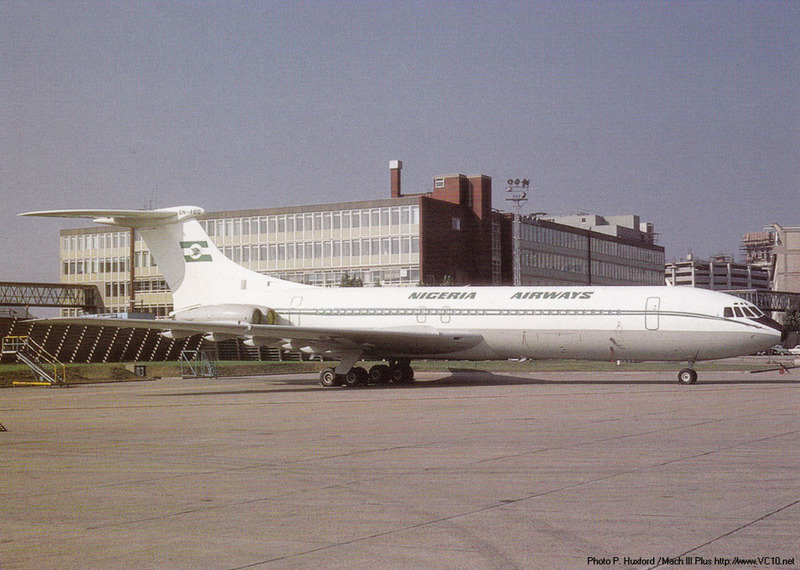 5N-ABD parked at Heathrow in 1969, perhaps before delivery to Nigeria Airways. 1. 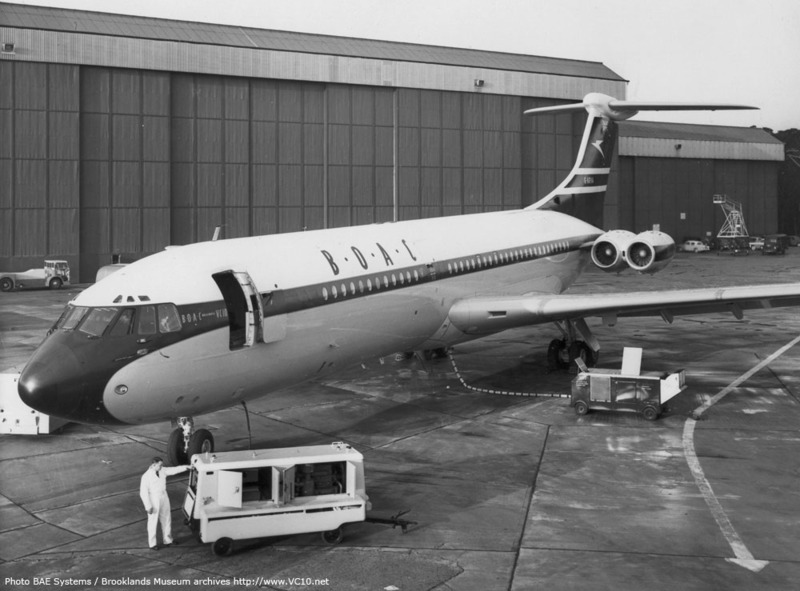 This photo shows that the livery applied to 5N-ABD was different from the one carried by G-ARVC, sadly 5N-ABD only flew in this livery for a few months before its fatal crash. 2. As 5N-ABD's career was so short, not many photos exist of this scheme, and several appear to have been taken in this corner behind the TBA building at Heathrow. NA White fuselage, grey underside. Green cheatline and Nigeria flag on fin.